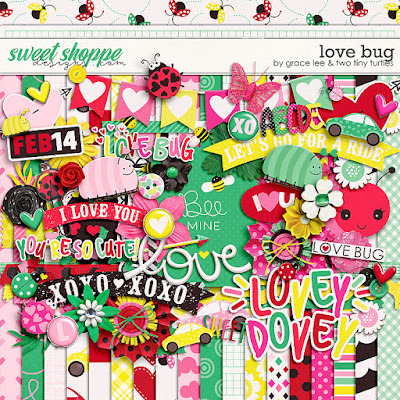 Love Bug a collaboration with Two Tiny Turtles is a super cute Valentine's Day-themed kit. With fresh, bright colors and lots of adorable doodles and illustrations, this kit can be used to scrap your ride in your beetle car or photos of you and your love bugs! and 88 elements. The elements included are: 1 arrow, 1 banner, 1 bow, 1 butterfly, 1 caterpillar, 4 buttons, 1 card, 3 cars, 1 clip, 3 flairs, 15 flowers, 6 foliage, 4 frames, 4 hearts, 2 hearts with arrow, 7 labels, 6 ladybugs, 3 love bugs, 1 paint, 4 ribbons, 1 ricrac, 2 scatters, 5 tape, 3 titles, and 8 word art.